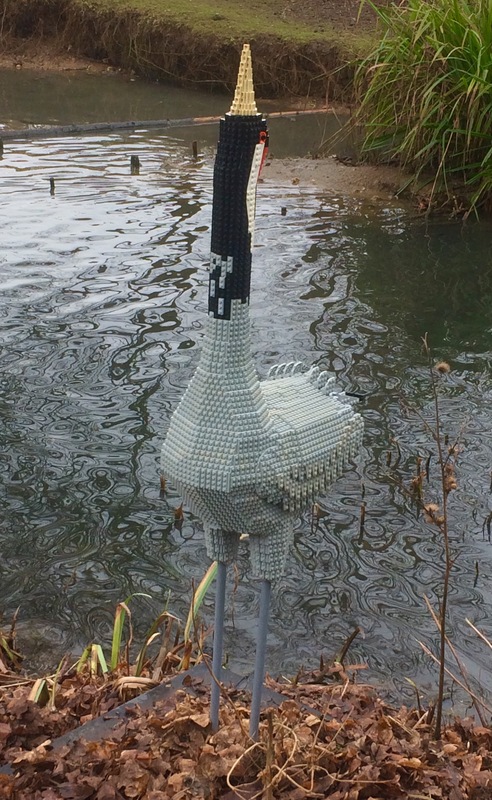 ﻿Last weekend we visited the Wildfowl and Wetland Trust’s London Wetland Centre in Barnes. As well as lots of wonderful wintering wildfowl, the centre has a collection of Wetland birds from around the world and a pair Asian short clawed otters. 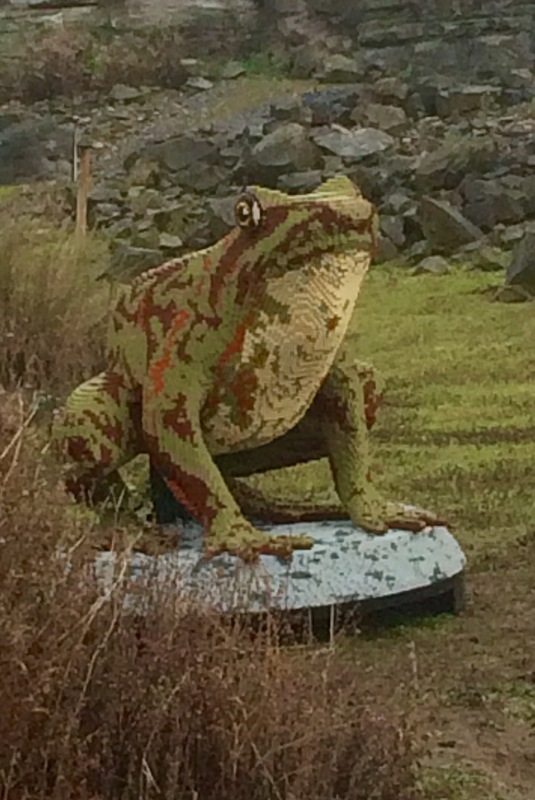 At the moment the Centre also has some visitors of a different kind, a whole collection of giant lego animals. We really loved these, so I thought I’d share them with you! Did you know that the collective nouns for otters include bevy, family, lodge, romp or raft (to describe them in the water)? Romp is a great description for otters as they are very playful. In fact they appear to engage in some behaviour for the sheer fun of it, such as making water slides to play on. 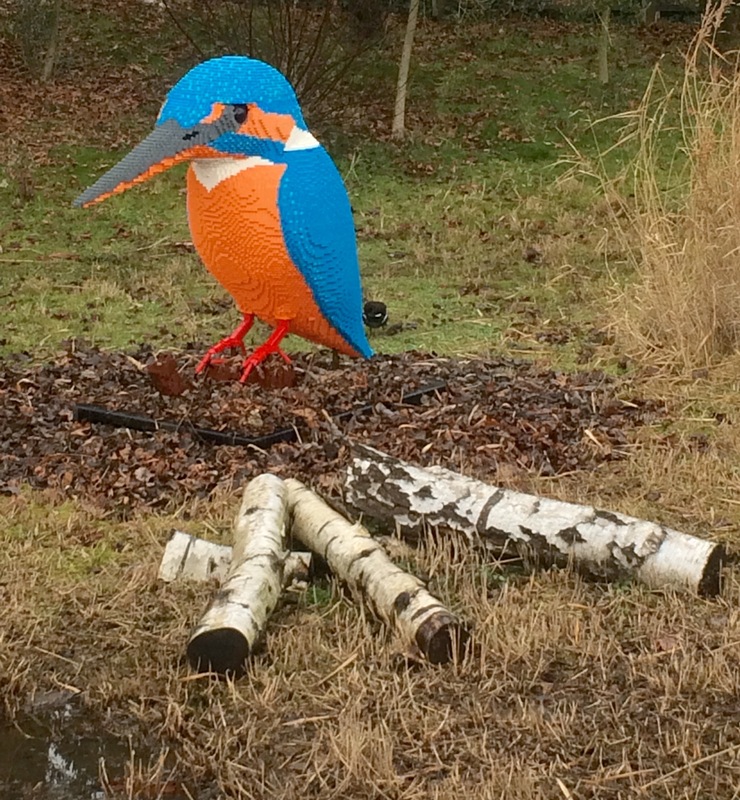 The closest we come to a British parrot in terms of fabulous, gaudy colour, kingfishers are bright orange and iridescent blue, a flash of colour across lakes and streams. They’re one of my favourite birds and I’m lucky to have a spot where I regularly see them in the summer. There are 3,800 to 4,600 breeding pairs in the UK, more common in the south of the country, but it is possible to see them in most places, with the population in Scotland on the increase. 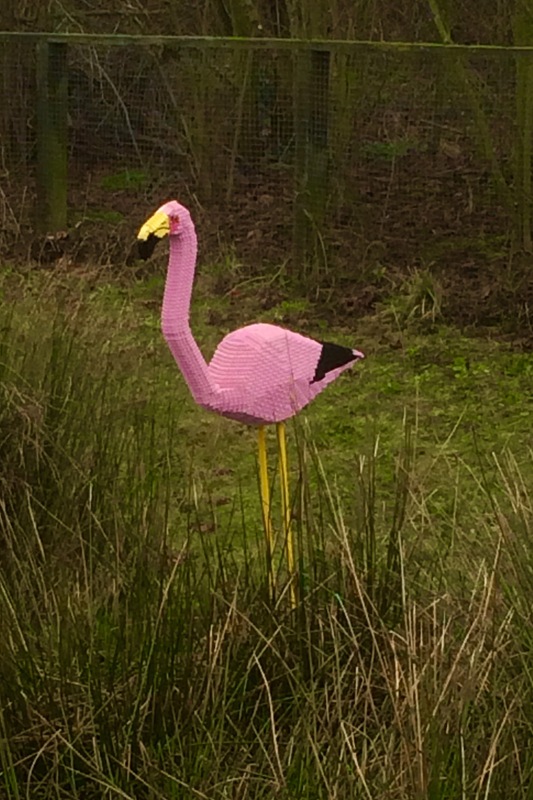 Flamingo means “flame coloured” a fitting name for these stunning birds. There are six species of flamingo, 2 in Europe/ Africa/Asia and 4 in the Americas. The Greater Flamingo is the most widespread, found in parts of Africa, Southern Europe and South and South West Asia, although the Lesser Flamingo, found from Africa to North West India is the most numerous. Britain’s bulkiest dragonfly, large, impressive and beautiful. The emperor dragonfly flies high up looking for prey, including butterflies and chaser dragonflies, which it will catch in mid air and may eat on the wing. A fantastic creature to see in summer, on the wing from June to August, surprisingly noisy on the wing, you can hear the wing beats of one gets close to you. Also known as Hawaiian geese, Nene are endemic to the Hawaiian islands. 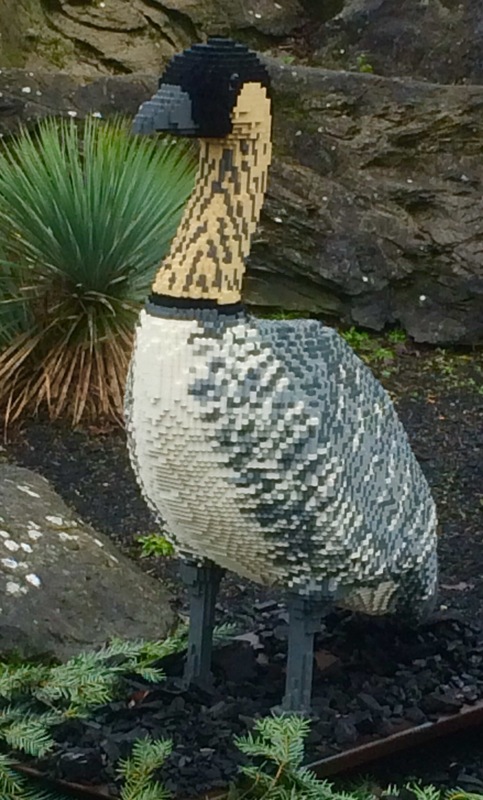 This is the world’s rarest goose. In 1952 only 30 birds were left, the population decimated. 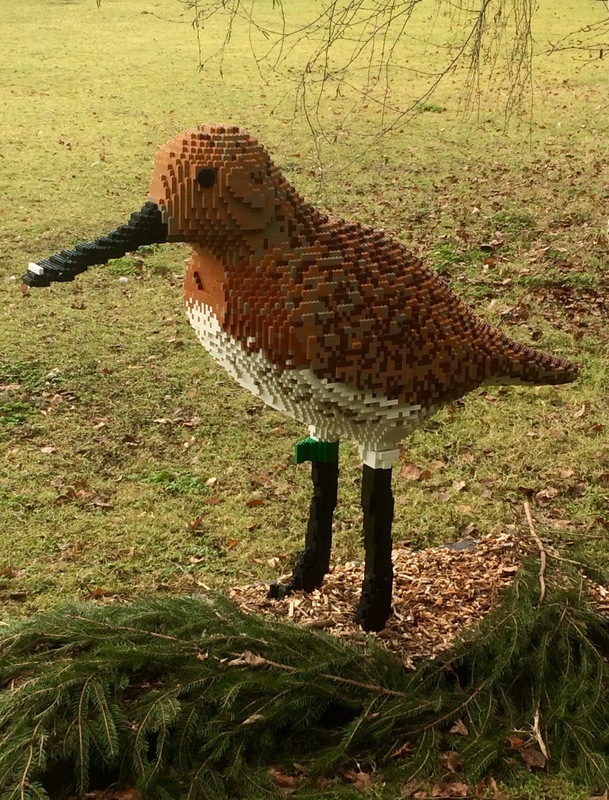 WWT launched a captive breeding programme and later reintroduced birds they had bred back into the wild. 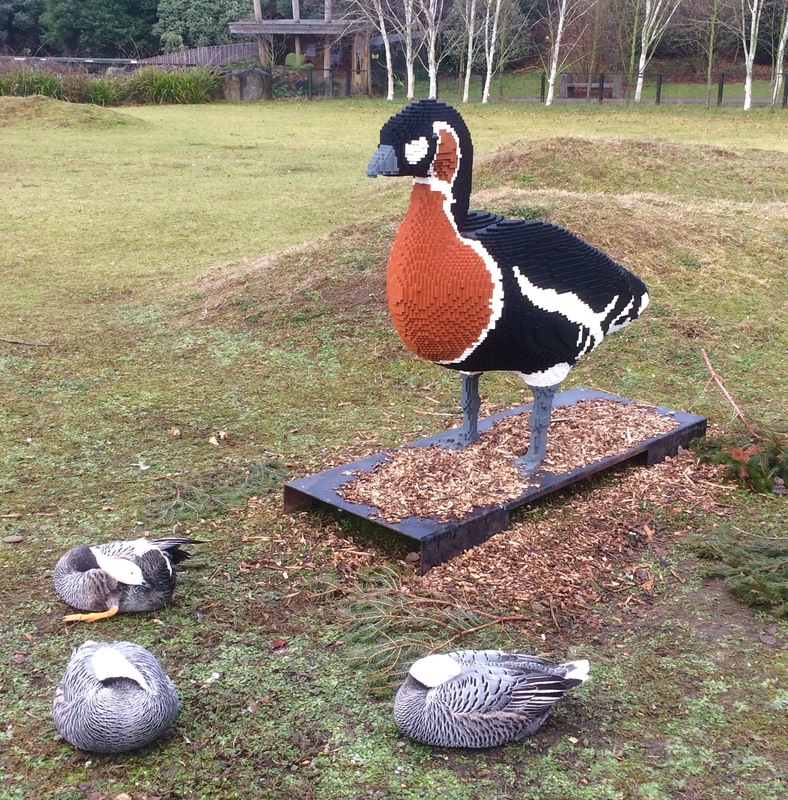 You can see Nene at several of the WWT Centres, including WWT London. They are friendly and inquisitive little geese and we always enjoy seeing them. There are 15 species of crane in the world. They are unrelated to herons, although they do look similar. Most species of crane are classified as threatened, if not critically endangered. A pair of cranes can be seen at WWT London, stunning, delicate creatures with an innate grace, fabulous to observe. Bewick’s swans breed in Siberia and winter in the U.K. from October to March. Suki is a spoon billed sandpiper. They are critically endangered by reclamation of wetlands in China, South Korea and North Korea and by hunting in Burma. They are a species on the verge of extinction. Our most common and recognisable amphibian. Garden ponds are very important for common frogs, so add one to your garden if you can, even if it’s just a humble washing up bowl. This Winterwatch SOS has information on how to do this. Red breasted geese like Bruce are a rare visitor to Great Britain. They breed in Siberia and spend winters in Bulgaria, Romania and Ukraine. Until the 1960s most red breasted geese wintered in Kirov Bay in the Caspian Sea. A change in agriculture in the area from cereal crops to vineyards and cotton was bad news for the geese, as it made the area unsuitable for them. Fortunately they were able to alter their migration strategy and head for suitable areas in Bulgaria and Romania instead, avoiding catastrophic population decline. I love the way Bruce seems to be acting as a guard goose while these real geese sleep beneath him. 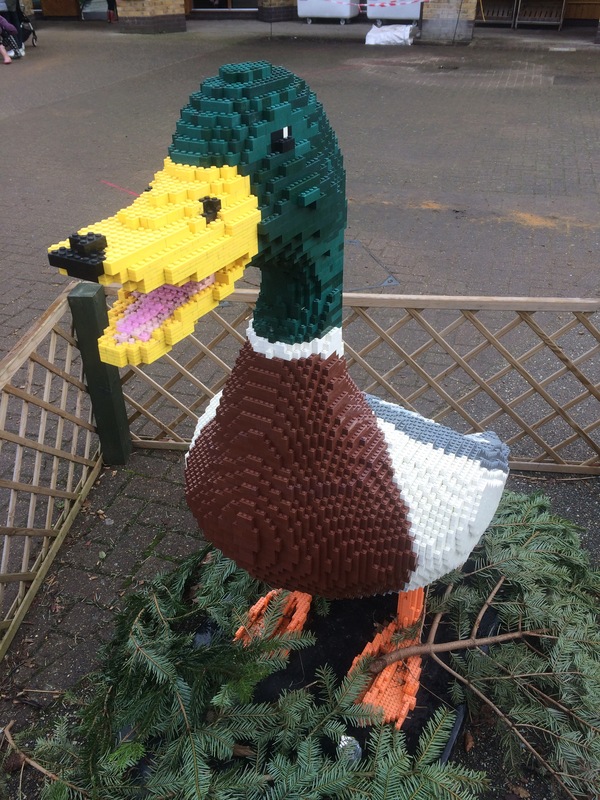 Finally, meet Mac, the very cheerful looking mallard. He needs no introduction, mallards are very common, favourite of small children feeding the ducks. The name mallard comes from “malart” or “mallart” the old French for wild drake. 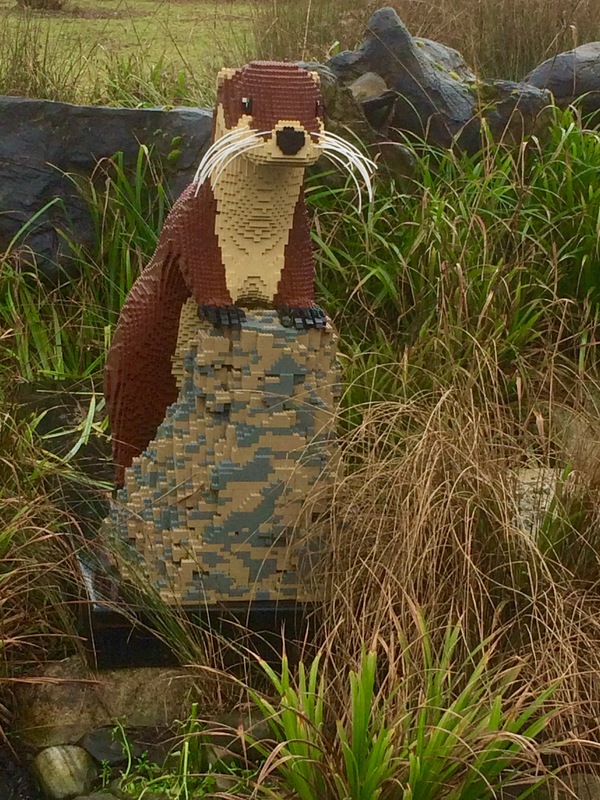 The Lego animals are amazing, very detailed and taking thousands of bricks and hours of time to build. 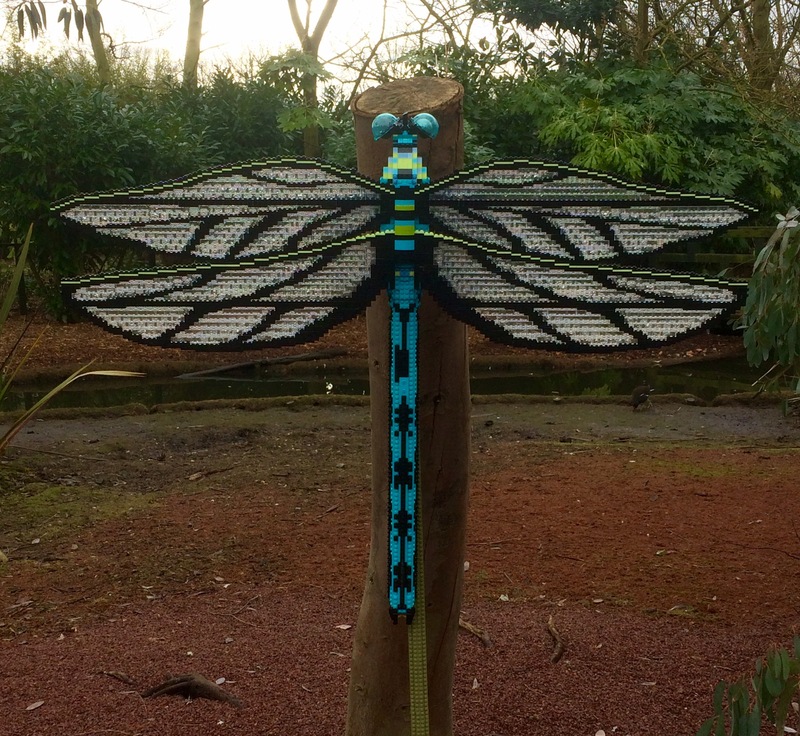 It’s good to see that they represent Wetland species including mammals, invertebrates and amphibians as well as birds and the trail makes a great addition to the Centre. They’re fantastic aren’t they. Amazingly realistic! 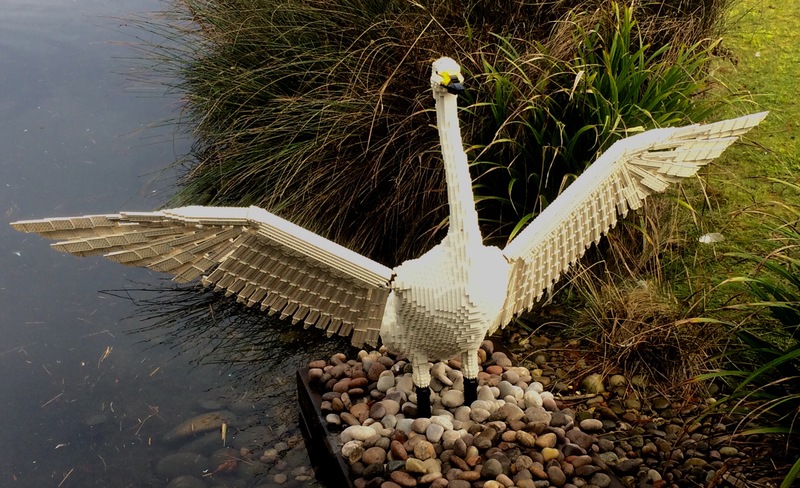 Wow it’s amazing what people can create with Lego. I like the dragonfly and the frog best. The dragonfly is one of my favourites, I love the nene the most!